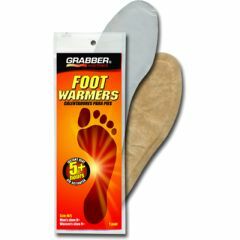 Grabber Foot Warmers are thin, comfortable air-activated warmers that fit in your shoe or boot, and provide over 5 hours of soothing warmth to your feet. The latest addition to the best-selling Grabber line, Foot Warmers contain a revolutionary warmer technology. Grabber Foot Warmers are standard equipment for skiers, snowboarders, hunters, campers, hikers, birdwatchers or anyone who enjoys outdoor activities when the weather is cold. Foot Warmers are widely used for portable, long-lasting heat therapy. If you suffer from cold, sore feet and toes as a result of Arthritis, Raynaud's, Lupus, Scleroderma, Sjögren's, Myalgia or just poor circulation, Grabber provides soothing warmth.